Born in 1964, the last year of the Boomers or the first year of Generation X, depending upon who's counting, Kim McLarin came of age as part of the first real "Brown vs. Board" generation, and that experience, of America first embracing and then rejecting a real and meaningful beloved racial community, has shaped everything in her life. 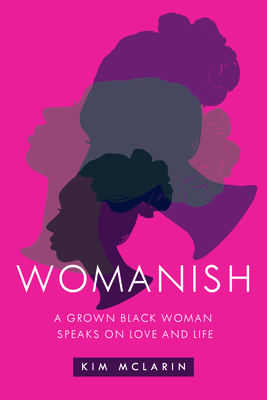 Searing in its emotional honesty, Womanish is an essay collection that explores what it means to be a black woman in today's turbulent times. Writing with candor, wit and vulnerability on topics including dating after divorce, depression, parenting older children, the Obama's, and the often fraught relations between white and black women, McLarin unveils herself at the crossroads of being black, female and middle-aged, and, ultimately, American. Powerful and timely, Womanishdraws upon a lifetime of experiences to paint a portrait of a black woman trying to come to terms with the world around her, and of a society trying to come to terms with black women. Kim McLarin is the author of the critically-acclaimed novels Taming It Down, Meeting of the Waters, and Jump at the Sun, all published by William Morrow, and a memoir, Divorce Dog: Motherhood, Men, & Midlife. Her work has been honored by the Massachusetts Center for the Book, the Barnes & Noble Discover Program, the Hurston/Wright Foundation and the Black Caucus of the American Library Association, among other organizations McLarin's nonfiction writing has appeared in The New York Times, Glamour, The Washington Post, Slate, The Root and other publications. She is a former staff writer for The New York Times, The Philadelphia Inquirer, and The Associated Press. McLarin appears regularly on the Emmy-Award winning show Basic Black, Boston's long-running television program devoted to African-American themes. She is currently an associate professor in the Department of Writing, Literature and Publishing at Emerson College in Boston, and a member of the board of PEN New England.